My Beautiful Wisdom BookI keep Wisdoms safe in my heart. 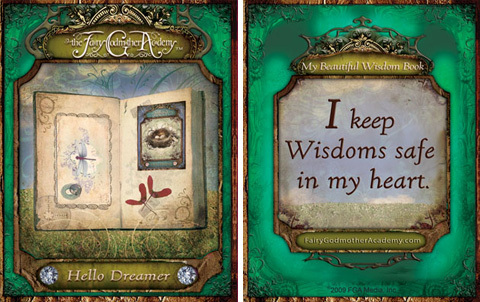 Collect your Wisdoms in your own one-of-a-kind Wisdom book! Step 1. Choose a small blank book to decorate. The perfect little book could be out there waiting for you—look around! 5 inches x 7 inches or smaller works well for Wisdoms. If you find a great book, skip down to Step 2. Find some pretty paper (bonus points for recycled paper!) and decide on a size. One easy way to make pages is to fold printer-size paper into quarters and then cut along the folds. Important: you’ll need an inch on the left side to bind your book. Remember that you won’t be able to write or draw in this space. Fold and cut at least 5 pages and stack them all together. Try mixing different colors of paper, too! If your book is really small, it’s OK to just mark 2 holes. Use a hole punch to make holes in the top page, and then use it as a guide for making holes in the rest of your pages. Paperback style: Use sturdy paper that’s still a little bendy. Try file folders, heavy watercolor paper or paper bags. Cut out 2 covers that are the same size as your inside pages. Hardback style: This cover has a bend along the bound side that makes it easy to open your book flat. You can use heavier paper like cardboard, mat board or foam core board. Cut out 2 pieces the same size as your inside pages. Then cut a 1” strip lengthwise (vertically) from each cover. For each cover, glue the 2 pieces about ¼ inch apart onto a big piece of pretty paper or fabric that is 2 or 3 inches wider all around than the cover piece. Once the glue dries, wrap the covers with the paper/fabric just like you would wrap a present and glue it down. Then glue a different color page on the inside of each cover. a hardback cover can bend to make it easier to write or draw. paste in an endpage and punch holes to match the inside pages. Place the inside pages on the cover so it lines up the way you’d like. Use the inside pages as a guide to mark where the matching holes should be on each cover. Use a hole punch to cut out the cover holes on both covers. Put the covers on the outside of your pages, line everything up, and fasten with a binder clip. Tie your book together using yarn, twine, leather cord or fabric strips. Place a dot of glue on each knot to help it stay tied. pull string or ribbon through each hole. a finished book, ready to decorate. Draw, paint, or collage a beautiful cover. Don’t forget the back of the book and even the inside pages. Use these suggestions or find your own cool supplies. Step 3. Add your first Wisdom! Wisdoms guide our hearts and blossom as we grow. You could write this Wisdom on your first page, or come up with your own – maybe it’s from a Wisdom card you like, or something meaningful you’ve learned from a friend or family member. Best of all, maybe this is the place where you start finding your own internal Wisdom—whether it comes to you as words, drawings, or even music. Once you’re book is finished, tell Birdie about it and send her a picture! Now I get what “wisdoms” are! I love making books, so this is a very good wisdom act for me! This is such a great idea! I am gonna buy a little book and decorate it. I love my wisdom book I think I might put some wisdom card pictures on here….. I can’t wait to make my own book!! I’m thinking of taking an old unused hardcover book and replacing the pages with new ones. I’ll definetly use some of the pages of the book to decorate my wisdom book. I think I’ll just save the leftover book pages for other crafts, or recycle them. Good luck to everyone else!! Oh, and to Miriam, I love making books too! This will be fun! Nabiha, are you having fun? I am. Try using smallish pages. You can make lots by folding + cutting. I found some small colored pages I will put in. I am done. It is worth handbinding and handstringing. BEST PROGECT EVER! Why is the site different? THere are no games or crafts or memberships or anything! the website has evolved since we first launched – there is no longer a membership required (everything is free!). We still have fun crafts and wisdom acts to explore! Doe anyone have any good wisdoms? I suggest reading the Zenda books by John Amodeo, Ken Petti, and Cassandra Westwood. In the books, Zenda recieves musings, which are similar to wisdoms, as she has adventures and encounters troubles. I wrote all her musings in my wisdom book. I just got a journal at Michaels and redecorated the cover using a pretty picture, ribbon, some beads, and construction paper. This book is great. I wish I was a better artist. Wisdom book? Is that like a book of quotes? It’s a bit confusing for me. Any examples? I get it I should try this some time, Miriam I need some advice. Should I use regular sized pieces of paper, and how many pieces of paper should I use? I am ordering the Holiday Set of FGA books, eeeee! We’re getting it off the computer tomorrow. But….the next time I order something from FGA…do they have like a shop or something, because buying it off the computer takes longer and is more expensive. So do they??? I have no idea, but I know that you will have a lot of fun reading those! Cool! I made my wisdom book with a notebook that has a deer on it. i made this book and it is perfect to keep your wisdom in! I made a pretty thick wisdom book. It has 160 pages! This comment is for Tally, who just posted her comment two days ago. That is wonderful! I hope you enjoy filling your book with lots of good wisdom, both your own and other people’s. I made one when I was 9 years old, and ever since then have had some kind of special book for writing in (nowadays store-bought, but the home-made ones are the best!) ever since. I wish you a lifetime of collecting and enjoying good wisdom! I made the wisdom book when I was eight and I wrote some pretty funny wisdoms in the beginning! Although at firs it was supposed to be a journal. I wrote some letters backwards at that age!!! You’re most welcome, Tally! Yes, we can be goofy as children (I sure was! ), but even that goofiness can contain the seeds of something very special! Leonardo da Vinci had a special handwriting where it was all backwards on purpose; it was his special code. Me and my friend were saying words backwards as our secret language!!! I just finished mine. The cover is hot pink with blue ribbon and white blank pages. It may sound boring but I think it is awesome!